Meet Pat. Pat joined the Food Bank staff in January of 1988. During her 27 years of service, she logged almost 53,000 hours of hard work, a record in the history of the Food Bank. Over the years Pat has witnessed incredible growth at our organization. When she joined the Food Bank team, we had only five people on staff and operated out of a 10,000 square-foot facility on Sunrise Avenue in Raleigh. She worked at the Food Bank when a new system called Quicken came along, and staff were excited to computerize our entire book-keeping system. Pat watched the Food Bank grow from two branches to six, from just 55 partner agencies to now more than 800. In 1988 we distributed 429,000 pounds of food. Now we provide more than 57 million pounds of food to local communities. 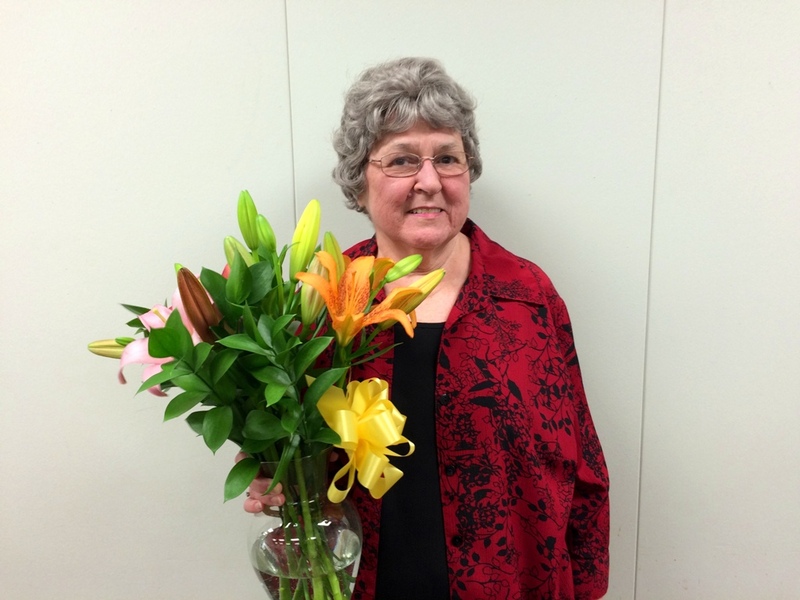 For 27 years, Pat was our backbone at the Food Bank. She was a loyal, steadfast worker. We will miss seeing her friendly face every day, but wish her the very, very best in her retirement. Congratulations, Pat, and thank you for your warmth, compassion, and service! 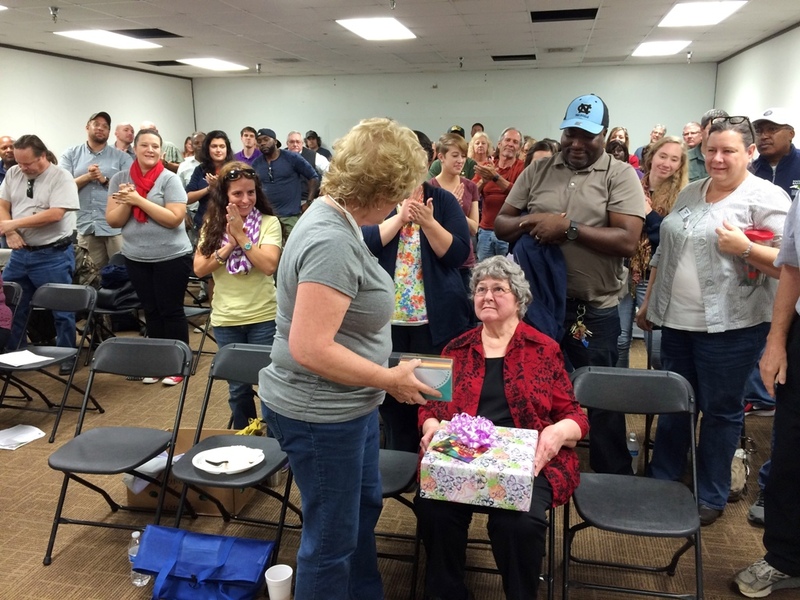 Food Bank staff honor Pat for her 27 years of service to the Food Bank at our annual Staff Day. 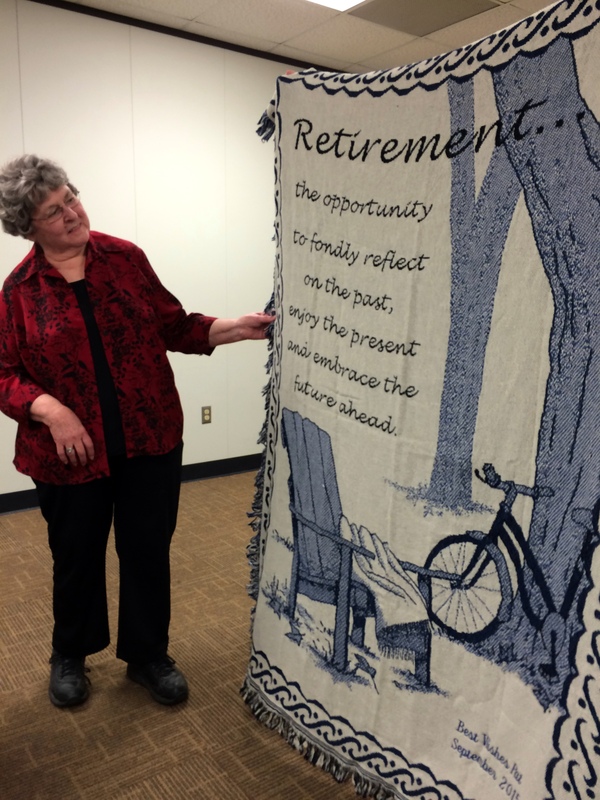 Food Bank staff gave Pat this blanket in honor of her retirement.